Interactive children's musical. Come early with your kids for fun crafts! Case Watson, Matt Webster, and Kate Mulberry in Hanna and the Moonlit Dress. Photo by Basil Rodericks. BOTTOM LINE: A sweet interactive musical for kids about enjoying life’s simple joys and spreading good karma. Hanna and the Moonlit Dress is adapted from the Israeli short story by Itzhak Schweiger-Dmi’el. Hanna (Case Watson), referred to as “Hanna’le” in the story (meaning “dear little Hanna”), comes home from school on a Friday afternoon, excited for the regular week to be over and to celebrate Shabbat with her Mother (Kate Mulberry). It turns out Mother has a surprise for Hanna: a new, homemade white dress for Hanna to wear for Shabbat. Hanna loves her new outfit, and runs outside to play and show all of her animal friends her beautiful dress. As sunset nears, Hannah discovers a Coalman (Matt Webster) in the woods who is carrying a massive sack in spite of his age and his fragile physique. She helps him carry his sack home. Unfortunately Hanna’s dress, which she has been trying so hard to keep clean for Mother and for Shabbat all afternoon, becomes covered with coal. Afraid to disappoint her Mother by going home in the ruined dress, Hanna must turn to her forest friends and to the Moon itself to help her. Overall, it’s a delightful little event for young audiences. Kids are handed paper stars when they walk in, then are invited to sit on a mat in front of the stage where volunteers guide them through paper crafts—coloring the stars, making flowers and butterflies from coffee filters and pipe cleaners, etc.—until the show starts. Throughout the performance, the actors encourage participation from the kids sitting up front: They have the kids talk about what they like to do on Saturdays, use the paper crafts they made before the show as props in the performance, and sing and dance along. It is also worth noting the incredible patience and flexibility it takes to perform for children who are still learning the proper decorum for attending public theater; when a young audience member would call out at an inopportune time, the actors never get flustered, but instead either work around the interruption, or incorporate the vocal child into the scene they are already doing. (There are also aides around to assist should any major disturbance arise, but in general the children I observed were fairly well-behaved and even started policing each other about not calling out during the show.) Bravo to Case Watson, Kate Mulberry, and Matt Webster for that feat. Readers may be wondering, given the Theater at the 14th Street Y’s mission to “create an inclusive and open cultural experience for all,” if a story with such strong Jewish roots can be appreciated by children and families from other cultural backgrounds. I would say yes. After all, the only references to Judaism are the setting itself (on a Friday night, when Shabbat, or the Jewish Sabbath, begins every week at sundown), and the uses of Hebrew words like “shalom” (hello/goodbye/peace) and the occasional “ima” (mother). The characters seem to embody Judaism in the way they speak about Shabbat, but never mention its religious underpinnings, and their neutral white jumpsuits do not denote a specific faith or sect. The program note also alludes to the Coalman symbolizing Elijah, the prophet Jews believe will come to redeem the world; however this imagery is neither immediately obvious to anyone not looking for it, nor a necessary piece of information in order to appreciate the basic story. And while the moral might be inspired by Jewish teaching, enough other faiths and belief systems carry a lesson similar to “your good deeds will come back to you” that it resonates with audiences across all backgrounds. The production’s design is lovely in its simplicity, with surprises for youth and adult audience alike. All the set and costume pieces/masks (designed by Yoav Gal) are white, and 90% of these pieces are made from paper. This gives the piece a “storybook street theater” aesthetic, while also hinting at the purity and innocence of childhood Shabbats. Peter Hodgson and the cast contribute live music and foley effects, adding to the self-made aesthetic, and then Josh Benghiat’s lighting delicately fills in the remaining details, setting the tone, time, and place for each scene. Overall, the simplistic approach to the design supports the quiet kind of magic that resonates through Hanna’s world of childhood wonder. 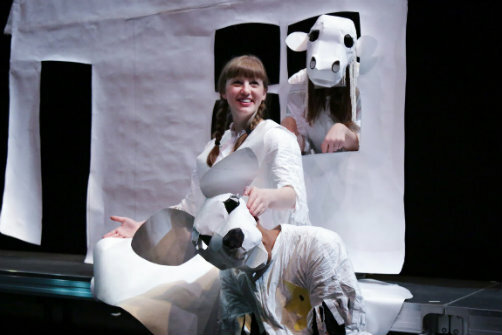 Hanna and the Moonlit Dress is created by Yoav Gal and Ronit Muszkatblit, based on the Israeli children’s book, Hanna’s Sabbath Dress, by Itzhak Schweiger-Dmi’el. Directed by Ronit Muszkatbilt. Music is by Rafi Ben-Moshe and Yoav Gal. Music Direction is by Peter Hodgson. Book Adaptation, Translation and Lyrics are by Gina Bonati and Ronit Muszkatblit. Set and Costume Design is by Yoav Gal. Lighting Design is by Josh Benghiat. Technical Direction is by Kryssy Wright and Claire Bacon. Associate Producer is Courtney Smith. Executive Producer is Becky Skoff. The cast Case Watson, Kate Mulberry, and Matt Webster.